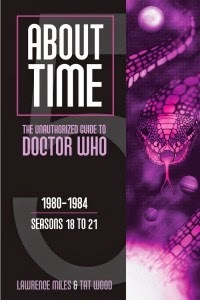 Yours truly has been out of commission writing a book that, surprisingly, has nothing whatsoever to do with Doctor Who. I'll likely mention it again when it's published. In the meantime, back to your daily Doctor Who newsposts. In the interim, the ebook edition of "About Time 5" has come out. "Volume 5 of this series covers Seasons 18 to 21 of “Doctor Who,” focusing on the end of Tom Baker’s tenure as the Doctor, the whole of the Peter Davison era and the start of Colin Baker’s time with the show in mind-bending detail. In addition to the usual concerns such as the TV show’s continuity (alien races, the Doctor’s abilities, etc.) and lore (anecdotal, “Did You Know?”-style material), authors Lawrence Miles and Tat Wood will examine each Davison story in the context of the year/historical period it was produced, determining just how topical the stories were." Seasons 18 to 21 because that's when the John Nathan-Turner era begins, for better or worse. The text has been updated a touch to smooth out the editing, take note of the new series (trying to make sense of the Blinovitch Limitation Effect so as to account for all the episodes where it would be relevant was fun), and add some details unknown in 2005. It's remarkable how chatty Christopher Bidmead has become about his tenure on the programme since the invention of Twitter, for instance.